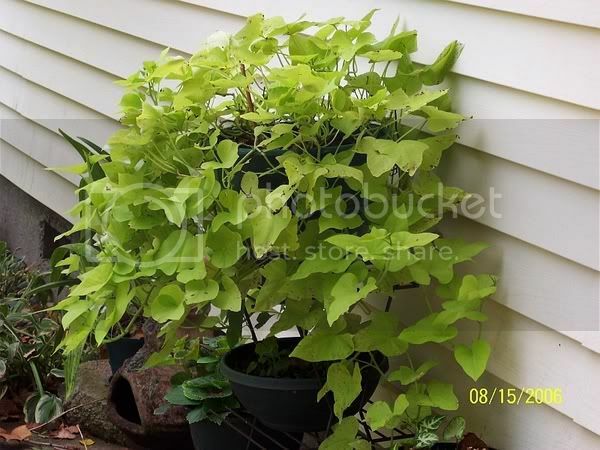 I have two beautiful potato vines- one is in a hanging basket, the other in a plastic pot. My question, is what to expect in the Fall. Will the leaves die off? And if they do, will I have a sweet potato to save for next Spring? Also, can they come in for the Winter? Can I store it in my basement? Or are they annuals? The first year I had Sweet Potato Vines, Blackie and Marguerite, in containers and tried to overwinter them in the house with dismal results. I don't know if they didn't get enough light although they were in a south window setting or if they just don't do well indoors. The following year, I bought new plants and in the fall, took cuttings, rooted them in water over the winter, potted up early spring and they did wonderfully. I should say the Marguerite did wonderfully...the Blackie didn't make it at all. Last year, the pots they had been in were full of small tubers which I intended to save and pot up but I somehow managed to lose the dang sackful in the garage somewhere. They'll be too dried out and shriveled to use if I should run across them now. It's my understanding that the tubers can be overwintered indoors and planted the following spring. Gardeners in warmer zones are also treated to the lovely blooms that don't happen in a shorter growing season like ours. Here's a picture of this years vines started from last years cuttings. Thanks for this subject. I was just wondering if I could keep my SPV's over winter. So I just take cuttings and leave them in water all winter? also, if you let them die off naturally, you can dump out the pots and get the "potatoes" to plant for next year. TulsaRose- I just took some cuttings. Jiffymouse- how would I store the potatoes through the Winter? I'm a Zone 5, so I don't believe they will survive outside. Thanks. put them in the basement or cellar. just like you would store any bulb or tuber. I'm confused. Are potato vines ornamental plants or the real potato plant? just keep them from freezing and you will be fine! I don't have a basement to store tubers. Do you think I could put them in a styrofoam cooler in my garage and that would keep them from freezing? The garage is unheated and sometimes it gets very cold here but sometimes not so bad. Last year it wasn't all that cold so I figure this year it will probably be cold. gailo, it's worth a try. Pack in some peat moss or something for additional insulation and they probably will be OK. You can take cuttings now to root in water and they will really put on a nice show in the house over the winter. Then pot up in the spring. I have 3 potatoes in a box in my basement right now! I thought it was funny that they looked like an actual sweet potato! well, this is good news! i really loved the tri-color spv that i bought this year! i'm going to root some cuttings and then let what's left die off and then store the pot in the basement...can i do that? or should i pull the tuber out of the soil? Rosie, I read what you wrote before about rooting in water and I did that. I was surprised how fast they rooted. I may have to break the thing I put them in to get them out. I think I will take some more cuttings just before frost so I'll have an extra chance to get them through winter. I will try the tubers in peat in the garage in a styrofoam cooler and let you all know how it works.